I love this sugary stone! It is hinged at the top so wearer gets some extra movement out of the piece when wearing it. It swings very fluidly and it quite an eye catcher. Check out some of my other pieces...color variations make quite different statements. 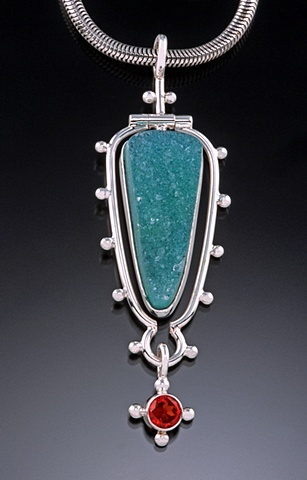 This piece can be made with any number of stone variations creating a subtle or "ZOWIE!" statement. Feel free to contact me via email for other stone possibilities...and of course an estimate.